Lakes Highway District serving North Kootenai County in North Idaho. Thursday, March 07, 2019 - Does Your Construction Site Need a Stormwater Permit? Lakes Highway District has adopted the Adopt-A-Highway Program. For more information please contact the District Office at (208)772-7527. Lakes Highway District has lifted additional load limits throughout our district as of Monday, April 22, 2019. Click here for more information. The Lakes Highway District was formed in May of 1971 as a result of the consolidation of the Kootenai County Road Department and four individual highway districts: Belmont, Bench, Dalton and Hayden Lake. As part of the consolidation in 1971, Lakes Highway District along with East Side, Worley and Post Falls Highway District formed an association named the Associated Highway Districts of Kootenai County, Idaho. The purpose of this organization is for the betterment of the secondary highway system in Kootenai County through cooperation, sharing of knowledge and ideas common to and for the benefit of the four Highway Districts in Kootenai County. Lakes Highway District maintains the rural county roads in the areas surrounding Coeur d'Alene, Dalton, Hayden, Hayden Lake, Avondale, Twin Lakes, Spirit Lake and Bayview, Idaho. The District Boundaries generally lay north of Best Avenue in Coeur d’Alene up to the Bonner County line, east of State Highway 41 and north of the Rathdrum City Limits. The District maintains approximately 567 lane miles of road within its jurisdiction. 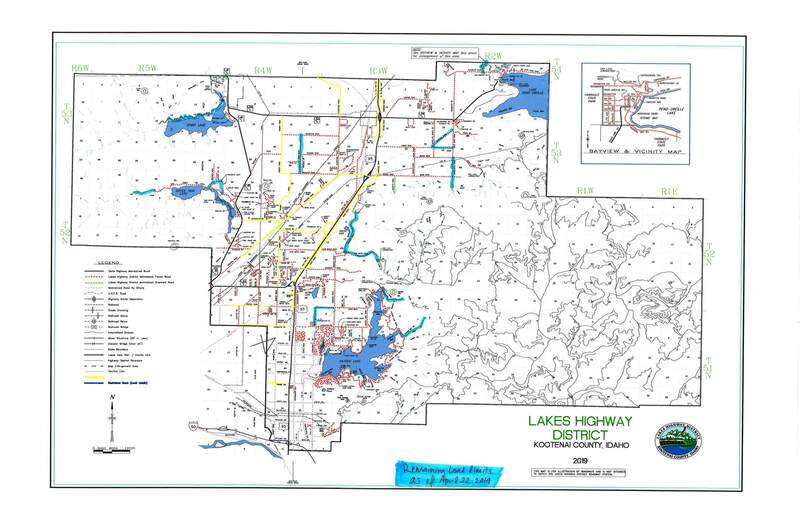 View Lakes Highway District Map. The Lakes Highway District is an equal opportunity employer with the office being located at 11341 N. Ramsey Road, near the Coeur d’Alene Airport. District personnel consists of three commissioners, director of highways, deputy director of highways, clerk, treasurer, permit coordinator/receptionist and 16 maintenance personnel.